Professional cirque-style entertainment! Hire with confidence - Mesmerie Entertainment LLC delivers elite-level insured performers with complete professionalism. 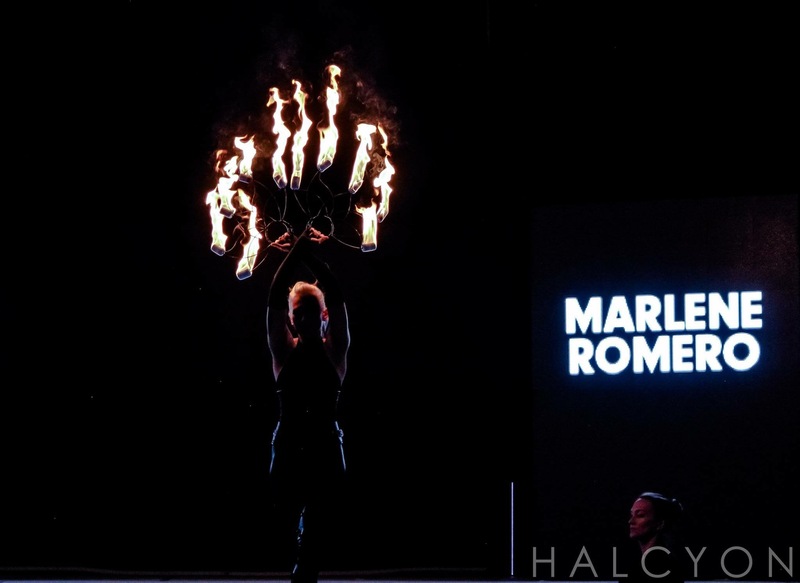 Fire safety knowledge and experienced aerial rigging is key to delivering a safe and spectacular performance for you and your guests, liability insurance included. Costumes and makeup to fit your theme, solo or group performances. All five of the entertainers were extremely talented, exceptionally professional, stunning, mesmerizing, fabulous, unbelievable and amazing. The entire experience was beyond our expectations and was seamless. We had over 900 guests at our annual Nutcracker Ball. The ball's theme was Cirque du Ballet. Mesmerie Entertainment LLC arrived early, they were all prepared and overwhelmingly talented. Their costumes were beautiful and fresh and perfect for our event. Each entertainer interacted with our guests and remained engaged and enthusiastic to take photos and answer questions. Most definitely one of the highlights of our Ball. Lone Star Ballet Guild highly recommends this organization and would love to work with these entertainers in the future. Thank you so much for your glowing review! It was our pleasure to travel to Amarillo, TX to work with the Lone Star Ballet Guild. Congratulations on a spectacular event and thank you for booking Mesmerie Entertainment LLC! We recently used Mesmerie Entertainment LLC at our annual Gala and we couldn't have been happier. From the initial contact they were responsive, professional and very easy to work with. Our theme was "Under the Big Top" and their talent fit in perfectly with that. Our guests really enjoyed the "tricks and stunts" during the happy hour/silent auction portion of the evening. The talent at Mesmerie Entertainment never got in the way and added just a little bit of extra fun for the evening. I would definitely use them again! Thank you so much for your positive feedback! Our four performers (stilt walker, juggler, contortionist, magician) had a wonderful time interacting with your guests at the Gala. We're delighted our entertainment fit perfectly for your event! We hired Katie to put together a "circus" for our wedding reception. From the planning stages through the actual event Katie was timely, professional, and helpful. Katie helped us take an idea from a somewhat shaky conception, and turn it into a really spectacular performance. She handled communication with the venue including insurance requirements, managed several other performers, and did it all while working within our budget. We could not be happier with how the evening turned out, and how Katie represented us on our special night. Thank you so much for including Mesmerie Entertainment in your celebration! Your genuine feedback is greatly appreciated, and I'm delighted that we were able to create a "circus" themed show that fit your budget and amazed your guests. Professional and prompt communication is key, and I'm very pleased to hear we met and exceeded your expectations! We hired Mesmerie entertainment for our coffee shop 1 year anniversary party. Everything from beginning to end was perfect. The communication was perfect in the beginning to help set up exactly what we needed and all performers showed up and were so personable and interacted with party goers. They all were the highlight of our event. We will definitely use them again for future events. Thank you so much for booking Mesmerie Entertainment for your anniversary event and for your glowing review! We loved working with you! We hired Mesmerie for an event we were holding at the apartment community I work at. They arrived on time, were professional, and also are extremely talented. Our residents keep asking when we will bring the lovely aerialists and the fire-breather back! Seriously, thank you for an experience our residents will not forget! Thank you so much for your glowing review! Your administrative team was communicative and professional; each and every staff member at Veranda Highpointe made us feel welcomed and valued. Thank you for inviting us for your Epic Glow event and we look forward to collaborating with you again in the future! Highly Recommend for a brewery gig or party! I am so sorry, but I have been meaning to write this review for a long time and Katie deserves way more than five stars. I do the events at Diebolt Brewing and we hired Mesmerie Entertainment for a burlesque show for our four year anniversary. We had food trucks, a barrel aged beer garden, multiple bands playing, multiple multiple beer tappings - but the highlight of our anniversary weekend was the burlesque show! Katie and Memphis moonshine was easy and professional to work with. I highly recommend them for your party or brewery/winery/cidery because they are awesome at drawing people in for events and we will definitely be working with them again! Not to mention, everyone had a blast! Thank you so much for your review! We appreciate you taking the time to comment on our professionalism and performance. Please keep us in mind for future events at Diebolt Brewery! Katie was very responsive right from the start. Very easy to communicate with and her performance was spectacular for our Carnival themed event. We would absolutely hire her again or recommend her to anyone looking for aerial acrobatics! Thank you so much for your glowing review! We are delighted that Katie's aerial silks performance was a good fit with your event and that our communication and professionalism met your expectations. Please keep us in mind for future events! I recently hired Mesmerie Entertainment for a school social event and I can't say enough good things about the group. They were incredibly talented, highly professional and were thoughtful about how to make our event a memorable one. Not only did they arrive early to set up but they drove through a snowstorm to get to the school! I would hire this company again in a heartbeat. Amazing Fire and Glow performances! Thank you so much for your glowing review! It was our pleasure to work with you and the Denver Zoo - we hope to bring more excellent performances in the future! Mesmerie Entertainment provided two stilt walkers for a family-focused festival celebrating pollinator appreciation month. Upon facing light rain and cooler weather, both stilts walkers were still a huge hit. The performers bared the weather and danced with our families (and our event team) despite the rain - keeping a big smile on everyone's face. We look forward to working with you in the future - thank you, once again! Hi Justin - Thank you so much for your glowing review! Our bumblebee stilt walkers love working with you and the City of Boulder; thank you for having us back year after year! I'm glad our performers kept the party going despite the inclement weather. Thank you! Had no idea what to expect when I hired Mesmerie, but she far surpassed my expectations. People are still talking about how amazing the show was. So thankful for hiring her and will definitely use her and her group for future events. Thank You!! Hi Robert! Thank you so much for booking Mesmerie Entertainment for your nightclub event! We're pleased to have met and exceeded your expectations! We are looking forward to working with Katie again in the future and plan to have her at our event every single year. A HUGE hit, very personable and outgoing! A HUGE hit with the kids AND adults! THANK YOU THANK YOU THANK YOU!!!! Thank you so much for your glowing review! We're glad to hear our performers were a gregarious addition to your mixed-audience event and we're looking forward to working with you again! Hi Angie - We're so happy we were able to reschedule your circus variety show performance after the weather-related disaster in Jackson Hole, WY! Thank you for the memorable event and please consider us for your next event! WE LOVED WORKING WITH MESMERIE! I was struggling to find performers for our cannabis industry afterparty when I came across gigsalad and found Mesmerie Entertainment. Katie was able to help me customize a performance line-up that was truly fabulous! She gave great suggestions on costumes to align with industry themes. 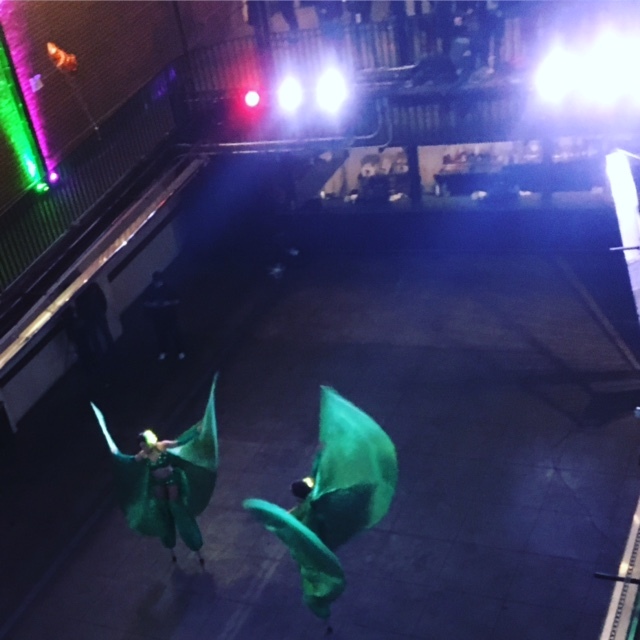 The stilt walkers were stunning, the LED Hula Hoop performances were exciting, the fire performances were captivating and the metal cube contortionist wowed the guests! I am thankful to have hired such enthusiastic professionals whose talent and professionalism were outstanding! Definitely consider Mesmerie Entertainment for all your entertaining needs! Thank you so much for your enthusiastic feedback, Julie! We loved dazzling the guests at your event and were glad to costume and perform toward your industry-specific theme. Our administrative staff works hard to curate entertainment to fit each event perfectly; we're pleased you found Katie's advice helpful! I was so happy we were able to have Mesmerie Entertainment perform at our winter gala. They provided professional, beautiful, exciting entertainment. It gave this event a special feel, and the attendees loved seeing the amazing talents of these artists. I would absolutely book them again for future events. They were very easy to work with and made the whole process smooth. Their addition made the event spectacular. Thank you so much for your honest feedback! Mesmerie Entertainment hires enthusiastic professionals who strive to make guests feel welcomed and immersed in the right vibe for your event. We're happy to hear you would book us again in the future! Thank you so much for your feedback, Kathy! We loved celebrating your birthday with you and we're pleased that we were able to dazzle your guests. I'm so happy that I went with Mesmeire entertainment, they're extremely reasonably priced, very professional and they completely exceeded my expectations. Best customer service I have received yet! Due to some unforeseen things that happened on my end they were extremely understanding and willing to help me and made my show a huge success. The performance was phenomenal and I will now only book them for future events! Thank you so much mesmeire entertainment for captivating and blowing away the audience all at the same time!! Thank you so much for your glowing feedback! Mesmerie Entertainment performers are flexible (pun intended!) and we're delighted that our customer service met and exceeded your expectations. We look forward to working with you in the future! We hired Mesmerie Entertainment LLC for a corporate halloween party, costumed characters and a fire eater to greet guests. The performers were all all very creative, professional and interactive. They consistently were making sure they kept guests entertained and made themselves visible to keep the energy up! Katie Brunner was very timely with all questions and the constant changes we had to make leading up to event before the contract was signed. Highly recommended!!! Mesmerie Entertainment was outstanding! They added such a special touch to my event and my guests are still raving! They were awesome to work with from my initial inquiry throughout the entire planning process and then completely exceeded my expectations on event day! I highly recommend contacting this company for any of your needs!!!! Wonderful and spectacular circus performer! Katie has a very nice personally, great circus performer skills, great communication skills, high professionalism (quick email/phone response, on time, safe while performing) and good humor sense! Besides all that Katie is beautiful in and out! Very pleasant to be around! Highly recommend to anyone who wants to make theirs special event fabulous, memorable, spectacular and creative! I hired Katie from Mesmerie Entertainment LLC to perform on aerial straps as the opening act for the fourth annual Colorado Pole Championship at the Boulder Theater on 5/21. Katie was easy to work with leading up to the event, she sent me her music file and stage introduction early on, and set up an easy-to-read performer agreement to make sure we both knew what was expected of the other party. Her performance was exactly what I had envisioned to get the show started - the audience could not stop cheering!! I would highly recommend Katie and Mesmerie Entertainment for any event organizers looking to take their show or corporate event to the next level. Hi Nina! Thank you so much for your detailed review. We're delighted that Katie's performance met your expectations and that you found the booking process to be timely and professional. Thank you again for your booking! These ladies showed up on time ready to rock 'n' roll and roll with whatever we threw at them. They stole the show!! Thank you so much for inviting us to participate with Mode Salon in the Denver Fashion Week 303 HairShow! We had a wonderful time working with you and your team! I cannot recommend this company enough. She was professional and a joy to work with. I plan to hire this company again and you should too. Thank you for the wonderful photo shoot and laughs. Katie and her staff were absolutely amazing! We booked them for our 1 year bar anniversary and they made it very special! I would highly recommend them for any time of entertainment need you have. Very professional as well. 5 stars all the way. Katie has been part of my aerial family for two years now. Even though I only get to see her once a year, when she comes to my studio to host amazing workshops, it seems like she's always here... she's always available for advice on a new trick or whatever I'm asking. No question is too trivial. Her workshops are amazing, she makes me feel like I can do anything and her instruction is motivating and super engaging. I was just a beginner when I participated in her first workshop so it was really amazing a year later to see my progress through her eyes. I also had the chance to watch Katie perform this year. She is absolutely amazing and so talented and humble. Every performer has great and not so great performances... it was really refreshing to see her backstage, just as nervous as the other performers and turning it on for the crowd. Katie was made for aerial!!!! Bottom line- Katie will be there for your training, for your encouragement and for your enjoyment. What an amazing group of young woman! They are beautiful and talented - are a pleasure to work with! Their routines were very tasteful and incredible. They made our cirque event over the top! I would hire them over and over again! You will be amazed. Talented, gracious, kind and amazing attention to detail. Thank you for your glowing review, Jennie! Your well-organized event and excellent communication made travel to Tulsa, OK a breeze. I'm glad we were able to dazzle your guests and enhance your Cirque-style event! Katie was amazing from the start! Very detail oriented and professional. She guided me every step of the way with booking the proper performers and utilizing the space. Quick email responses made it super easy. Then the night of our event her performers mirrored all the same great qualities that she had! The best part is still to come, the performers made our party! 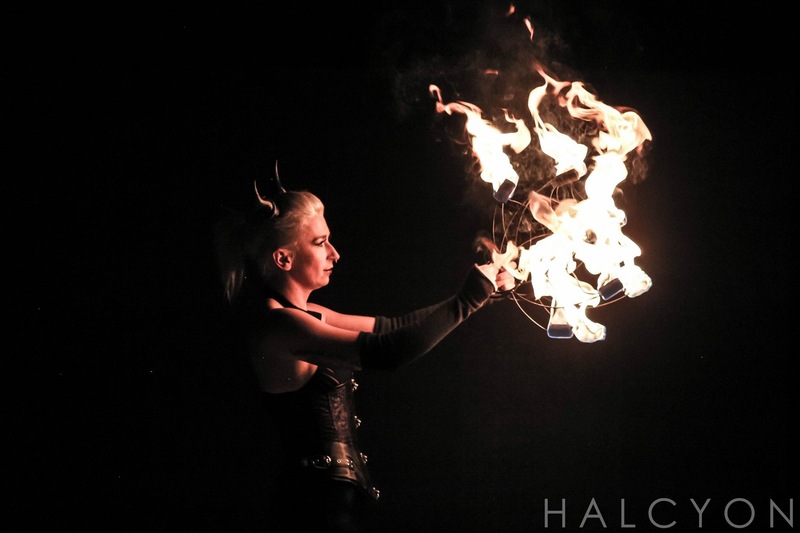 Between the fire dancer and contortionist it was a party that will surely be remembered! The whole team from start to finish was perfection! Can't wait to work with Katie and her team in the near future! Highly recommended! Thank you very much for your excellent feedback! I strive to create spectacular, safe entertainment that fits any budget and I'm delighted the performers hired for your event met your expectations. The Mesmerie Entertainment performers and I look forward to working with you again! I recent had Katie to perform at our school Fall carnival. The kids were mesmerized by her performance & she was super engaging with all ages! She showed up on time& ready to go! I can't wait to use her again! A wonderful addition to our carnival! Thank you so much for your review! I'm glad that I was a good fit for your event, and that I was able to engage your guests from diverse age groups. Thank you for your business and I look forward to entertaining you and your guests again! We loved having the performers at our party! 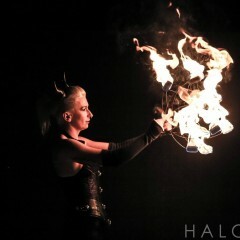 It was highly entertaining and left us with some awesome shots of fire and aerial art in the background. Had an overwhelmingly good response from the crowd, and loved working with the company overall. Would definitely recommend! Thank you very much for choosing Mesmerie Entertainment for your anniversary party! Your positive review is appreciated, and my performers and I had a spectacular time entertaining and interacting with your guests. Your choice to rent the small free-standing rig made a big impact with the fire and aerial in the photos! Katie was great. She came one time and was extremely professional. Definitely a vendor I would do more business with. Thank you so much for everything you have done for me and my family on Saturday! Everyone enjoyed the show and had fun! Thank you so much for your review! The LED show at your birthday party event was very fun, and you were a fabulous client - excellent communication, great on-site coordination, prompt payment and easy to work with. Best wishes for you and your family! Great performance! A little pricey but worth the money!! Katie was fantastic! She was friendly and looks awesome! She went above and beyond for our event and it was a huge hit! Katie Mesmerie has done fire, aerial and hoop acts several times for me and each time she brings something new to the table! Katie has a large repertoire which makes it easy for her to cater to our events and needs and she never disappoints. With wonderful stage presence and interaction, the audience has always been engaged. Can't wait to have her back! Katie Mesmerie is an unquestionably talented performer, truly knows how to engage the audience and hold a crowd. A Top Rate Performer in every way! Katie has performed for festivals and events at Two Hawk Hammock and Devil's Den Resort on numerous occasions and always put on a top rate show that was delightfully thrilling for the audience. I know that if I have Katie booked as a performer, the crowd will go home knowing they were part of a truly special event. I am looking forward to her performance next year at Two Hawk Hammock's 2014 Fall Festival. Katie has worked several events for our professional circus performance company, and every gig she has done with us, she has been timely, professional, polite, and well planned with her AMAZING acts. 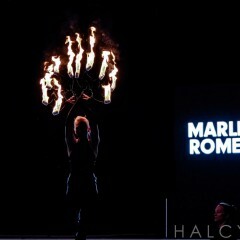 She is a beautiful fire dancer as well as a graceful and highly skilled aerialist. We hope to have the opportunity to work with her for many years in to the future. Insurance: $5,000,000 - Industry-standard coverage specific to fire acts and aerial work. Liability insurance certificate provided upon request. Individual certificates for interested venues may be produced with minimum one week's notice. 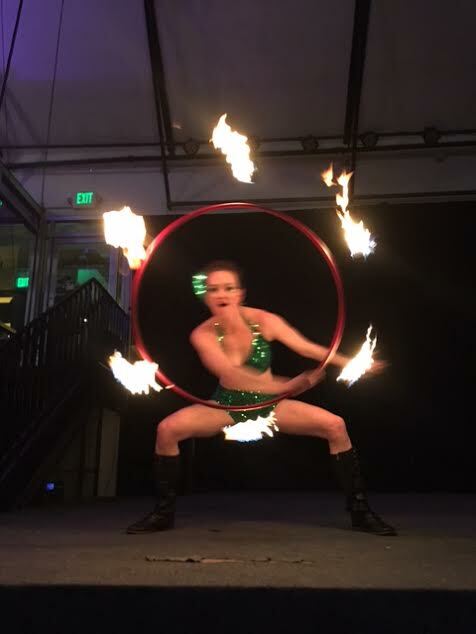 Mesmerie Entertainment is registered with the City and County of Denver Fire Marshall, circumventing the requirement for an on-site marshal for events with fire performance - a big savings to any local venue! Event planners should expect reliable and prompt communication, clear budget proposals and agreements, a signed contract, and performances that align exactly with agreements. Safety protocol will be followed unerringly; clear plans for rigging and un-rigging aerial equipment and safety procedures for fire performance are prioritized at every event. Katie Mesmerie will work with you, venue owners, and local authorities (e.g., fire marshal) to manifest your vision. Audiences should prepare to be amazed by performers at the very height of professionalism in aerial arts, fire performance, and circus entertainment. With a selective roster of network performers, Mesmerie brings together an entertainment package worthy of any big top! Katie Mesmerie is a full-time aerial professional and aerial instructor with years of experience - don't settle for less. 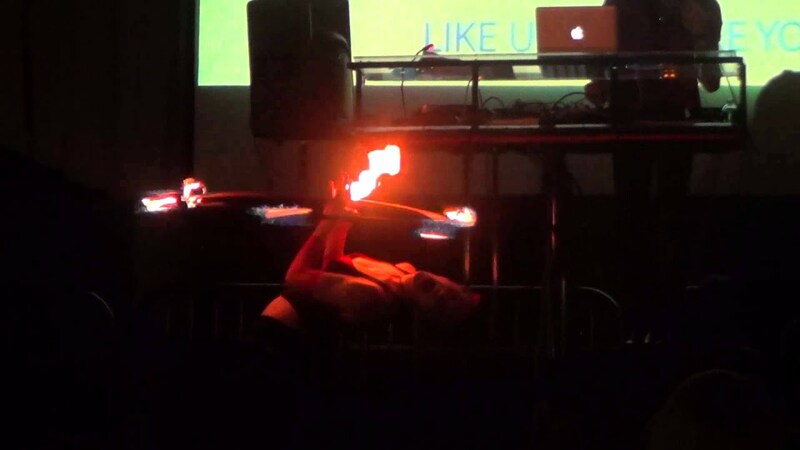 Katie Mesmerie is a full-time aerialist, fire performer, and circus artist. She currently teaches and performs aerial dance professionally in Denver, Colorado. With an extensive network of affiliated performers whose disciplines range from circus-traditional to more contemporary flow, "Mesmerie Entertainment" can bring together the group act you've been dreaming of! As a solo artist, Katie Mesmerie can entertain and amaze your audience while pleasing the budget-conscious planner and also offers large-scale productions through her network of performers with Mesmerie Entertainment LLC. Choose one act or combine several performances to create the atmosphere that's right for your event. Lend ambiance to any event with the "roving performer" experience, which can invigorate cocktail hours, mixers, or lulls in other programming. Want a "center stage" performance? Katie Mesmerie maintains several prepared acts in various disciplines and can choreograph specifically for your event or demonstrate freestyle performance at a moment's notice. With years of experience in various circus disciplines, she combines common sense with an eye for aesthetic to enhance your event with custom costuming, theme-appropriate music, careful choreography and an emphasis on safety. Booking Katie Mesmerie is easy; with a proven record of reliable communication and performance, you can count on her to light up your next event with a high degree of professionalism. Always conscious of safety, Katie Mesmerie carries up-to-date liability insurance and adheres to industry standard safety procedures. The safety of your guests, your space, and the performer is of the highest priority. Fire entertainment can take place outdoors or indoors. Mesmerie is independently registered with the City and County of Denver Fire Marshall's office, saving Denver County clients the expense of an on-site fire marshal. All fire acts come with industry-standard safety equipment, including fire blanket, extinguishers, and fire safety spotter. Any event booking fire entertainment must allow entry for the fire safety spotter. Fire breathing acts are limited to outdoor venues only due to the potential for fuel spatter. Once booked, Katie Mesmerie can complete a free site assessment to help you decide how a performance with fire can be safely incorporated into your event. Venues must be able to provide outdoor space for fueling equipment (other arrangements can be made on a case-by-case basis). Aerial rigging is pre-set before events and un-rigged at your convenience. Mesmerie Entertainment keeps several certified riggers on staff to assess the feasibility of aerial performance at your venue. Rigging before and un-rigging after shows will be scheduled before any event. Mesmerie Entertainment maintains an extensive network of certified riggers and can negotiate rigging consultation for complex venues. Free-standing rigs are available through Mesmerie Entertainment at additional cost. Green rooms and/or changing areas are required for events longer than 15 minutes in duration. Any small staging area will do! Stilt walking events require entry for a stilt safety spotter to maintain safe interaction between the audience and performer. 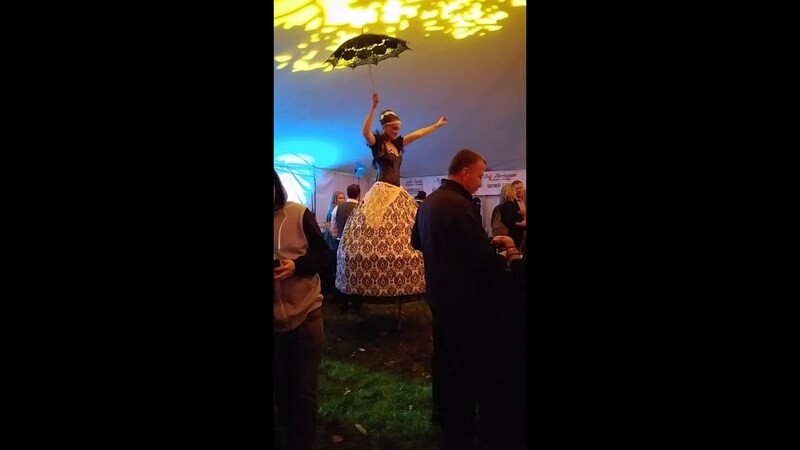 Green room space for stilt walking events requires a tall table, bar stool, or ladder for performer to get onto stilts before performance. June 15, 2017 • 6:00pm - 9:00pm Lighthouse Writers Workshop "Literary Circus"
While in the air performers can interact with audience members, pour drinks (consider aerial bartending! ), distribute promotional material, and more! - Unusual apparatuses: cube, harp, moon, and more! - Stiltwalking - While on stilts, performers can interact with audience, perform with hula hoops and/or fire, pour drinks, serve desserts, distribute promotional material, and more! Mesmerie Entertainment strives to produce original acts and understands that creative output is a process of inspiring, sharing, and collaborating. Inspiration is drawn from other professionals in the field, including Quixotic Fusion, Citric Acid Entertainment, Cirque du Soleil, and more!